Another one bites the dust. This time, millennials are killing canned tuna, according to a Wall Street Journal report. Consumption of canned tuna has dropped 42 percent per capita from the last 30 years through 2016, according to U.S. Department of Agriculture data. And the industry places the blame on younger consumers, who want fresher or more convenient options. “A lot of millennials don’t even own can openers,” Andy Mecs, the vice president of marketing and innovation for Starkist, said to the Journal. 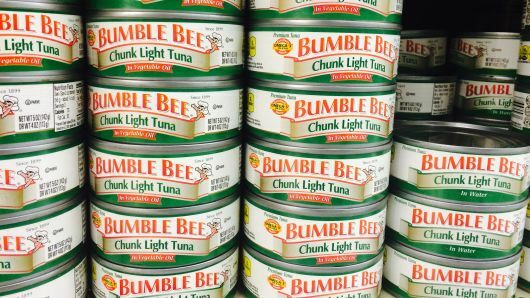 The struggle of the three largest canned tuna companies, StarKist, Bumble Bee Foods and Chicken of the Sea International, mirrors that of others in the packaged food industry, like Campbell Soup and Kraft Heinz. Younger consumers are turning away from processed foods, and new competitors are catering to changing tastes faster than the industry’s giants. To Ken Harris, managing partner at Cadent Consulting Group, the bigger picture is about convenience. “In the last 15 years, can openers became passe,” Harris told CNBC. Harris, who has worked with canned tuna businesses, believes that the traditional companies have fallen behind because it’s a low-margin business and investing in packaging falls low on the list of priorities. The main priority for canned tuna companies now, according to Harris, should be packaging that makes it easy to remove and drain the tuna. StarKist started re-thinking its product line-up in earnest about three to five years ago when the decline of tuna accelerated, Mecs said in an interview with CNBC. He remembered reading a newspaper article a few years ago about millennials recoiling from cereal because the bowl had to be cleaned. For him, the story reiterated how much consumers care about convenience. Upstarts like Wild Planet Foods and Safe Catch market their tuna as safer and higher quality and are slowly eating into the big three’s market share, the Journal said. According to Nielsen data as of October, smaller brands (not including private labels) control 6.3 percent of the market, up from 3.7 percent in 2014, the Journal said. To stage a comeback, the traditional tuna makers are taking a page from those brands. Bumble Bee and StarKist both have premium brands that they market as sustainable. They’re also focusing on the products that are working. Tuna pouches don’t require a can opener, and StarKist told CNBC that sales of its pouches are increasing by 20 percent annually. For the first time, the Pittsburgh-based company sold more pouches than their most popular can size in 2018. Kroger’s Home Chef, a meal-kit company, has partnered with the tuna brand to put its yellowfin tuna pouches in kits next year. Bumble Bee and StarKist have also turned to flavors favored by millennials, like sriracha. Chicken of the Sea is pitching it to younger consumers as a snack. The San Diego-based company started selling resealable cups of its flavored tuna this summer. Bumble Bee and Chicken of the Sea weren’t immediately available for comment when CNBC reached out. 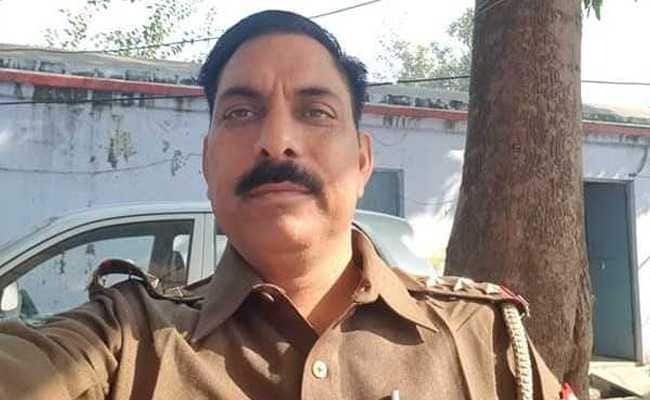 Two children, 11 and 12, have been named as accused in a case filed over cow slaughter allegations that led to a frenzied mob murdering a police officer in Uttar Pradesh’s Bulandhshar. The boys, who are cousins, are among seven named in a complaint of cow slaughter filed after carcasses were found strewn around in a forest near village Nayabans in Bulandshahr. The complainant, Yogesh Raj, is a Bajrang Dal activist who is the main accused in mob killing of inspector Subodh Kumar Singh. He is missing since the incident. Yogesh Raj is seen in a video arguing with the police and demanding action against cow slaughter on Monday, shortly before the situation went out of hand and a mob attacked policemen, burnt the police outpost and set vehicles on fire. Yogesh Raj’s complaint includes two children, one man who does not live in the village anymore, and three names the villagers have never heard. The village is stunned that children have been named for cow slaughter. The father of one of the boys says they were not even in the village the day of the incident. “The police came to our house, called us to the police station and kept us there for four hours. They took the names of the boys and took my phone number. I was told we should be called again if required,” the father said. So six of the seven names in the cow slaughter case are doubtful, NDTV learnt from inquiries in the village. One of the “accused” lives in Faridabad in Haryana and has not stayed in the village in 10 years. Headteachers and campaigners for children with special educational needs and disabilities (SEND) have reacted with fury to a government announcement that 16 grammar schools are to split a £50m bonus to create new school places. Making the announcement on Monday, the education secretary, Damian Hinds, said the 16 schools chosen to receive the additional funding out of 39 applications had been given permission to expand after setting out clear actions to prioritise access for disadvantaged children. Headteachers who have been campaigning for months to highlight the funding crisis in their schools described the move as “ill-judged”. Campaigners who are fighting SEND cuts to their children’s education through the courts said it was “sickening”. According to the Institute for Fiscal Studies, per-pupil funding in England is down by 8% in real terms since 2010, causing real hardship in schools. As a result, headteachers are increasingly asking parents for cash donations, with some schools forced to cut staff, SEND support and pastoral care. Headteachers who marched on Westminster in September to bring the financial crisis in their schools to the attention of ministers also expressed their disappointment. Jules White, the headteacher of Tanbridge House school in West Sussex and leader of the Worth Less? fair funding lobby, which represents 7,000 headteachers across 60 local authorities, said all schools deserved better funding. “When the Department for Education only ever talks about efficiencies rather than proper investment for schools, we are concerned that today’s announcement is ill-judged. In short, it will cost £12,500 to fund each new place under this capital expansion project. The opening of new grammar schools is barred by legislation passed under Tony Blair’s government in 1998, but the current government has made plain it is keen to increase the number of grammar school places, and in May Hinds announced the selective schools expansion fund, despite fierce opposition from educationalists and policy-makers. Critics argue that grammar schools are bad for social mobility. Recent figures showed that little more than 2% of grammar school pupils receive free school meals, compared with about 15% in other state secondary schools. The shadow education secretary, Angela Rayner, said: “Today’s announcement is a stark reminder that the Conservatives have nothing to offer the overwhelming majority of schools apart from more cuts. The government says the 16 grammar schools who have been awarded the additional funds have pledged to prioritise children who are eligible for the pupil premium for admission – these are children from the lowest income families. More than half of the schools approved have agreed to lower the mark required to pass the entrance test for pupil premium pupils – Altrincham grammar school for boys says a pass will be 10 marks lower for such children – and Chelmsford county high school says 16% of places (30 pupils) will be awarded to girls eligible for pupil premium. The schools also had to outline measures to improve outreach to children and families who might not otherwise consider applying to grammar school, including free entrance test materials available online and visits to primary schools and mentoring by sixth formers. Chinese national squads and a top league team have packed young footballers off to military camps for drills and Marxist-style “thought education” as a campaign to promote Communist Party values spreads even into the sporting world. Chinese fans have watched the militarisation of football with a mixture of anger and bemusement after pictures emerged of players getting their hair shaved and throwing themselves bare-chested into the snow. 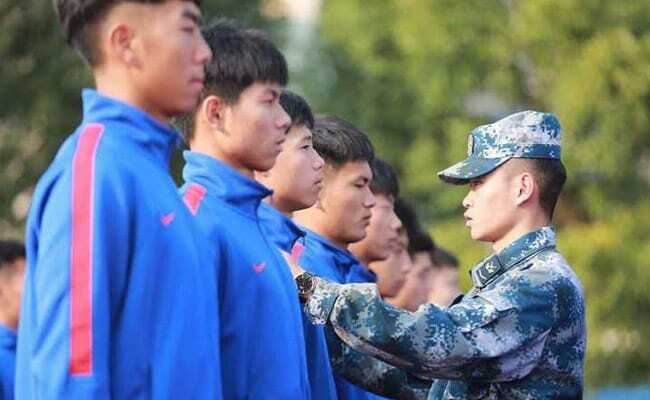 The Chinese Football Association (CFA) spirited away more than 50 under-25 national squad players in October for several weeks of intensive army drills, swapping their football boots for combat boots and military fatigues. The move, underlining desperation to improve the perennially underachieving Chinese national side, was particularly controversial because it meant some of China’s finest young players were not involved in the final games of the league season. A second batch of players was packed off in early November, and this week a national squad of under-19s was set to don camouflage and head to the barracks, suggesting that the boot camps may become a fixture. 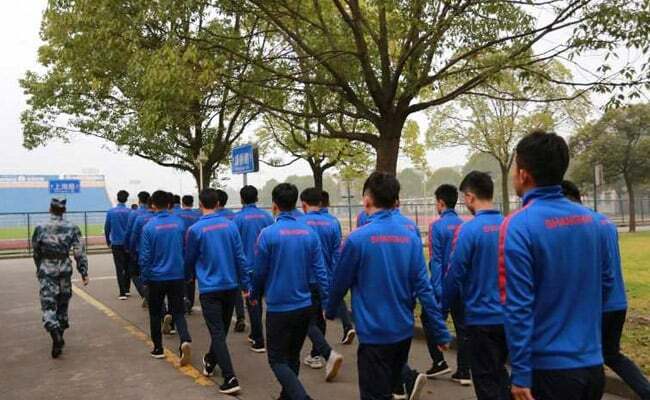 Chinese Super League (CSL) side Shanghai Shenhua — home last year to Argentine striker Carlos Tevez — followed suit with its under-19 players, combining football training with marching and other aspects of an austere military life. 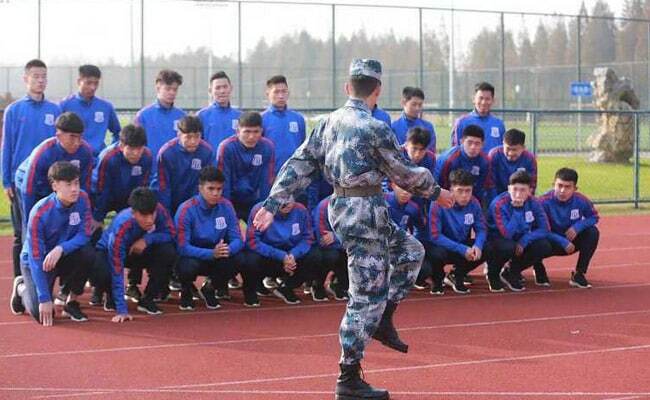 Under the watchful eye of the drillmasters of airforce unit 94778, the young players were subjected on Monday to “thought-education”, the club said on China’s Twitter-like Weibo platform. They “examined propaganda materials, visited the unit’s hall of history, soldiers’ barracks and took part in basic military formation drills”, it said. The players were also plonked down to watch the evening news on state television — a nightly hymn to the Communist Party — before hitting their bunks. The Beijing Youth Daily, citing the CFA, said that the camps will “strengthen young players’ ideology”. President Xi Jinping has conducted a broad campaign to bolster the ruling Communist Party that has drawn comparisons to past mass political campaigns under former leader Mao Zedong. Government departments, businesses and organisations across the country have signed up to the drive by conducting indoctrination sessions focusing on Marxist values and “Xi Jinping Thought”. Earlier this year, players for the national team began appearing in matches with bandages covering their tattoos, which the Xi government frowns upon in its purity campaign. But frustrated Chinese football fans accused the CFA of putting politics before football as it took dozens of domestic players out of action for the critical last few games of the season. Pictures subsequently emerged online of the under-25 players with buzz cuts and wearing military garb as they sat in a whitewashed room watching the senior national team’s 0-0 with India on television. A red banner at the front of the room exhorted them to be upstanding members of the public. Soccer News reposted pictures on Weibo said to be of the players baring their teeth and leaping half-naked into the snow. China’s World Cup-winning coach Marcello Lippi, whose final assignment with the team will be the Asian Cup in January, has not commented on the army-style initiative. As part of Xi’s efforts to make the country a footballing powerhouse, China made the 70-year-old Italian one of the best-paid coaches in the world when they hired him in October 2016.